I'll create 50+ backlinks for your site. MY SERVICE INCREASE YOUR SEO RANK. Backlinks without indexing no value. My backlinks service coming with indexing service. You can buy any place backlinks. But most of them didn't indexing your backlinks. These backlinks no value. NO INDEXING MEAN NO VALUE. I need your one URL and keywords(Max 5). I'LL SEND YOU ALL LINKS WITH PROOFS. IF YOU HAVE ANY PROBLEM WITH MY SERVICE PLEASE SEND ME A MESSAGE. DELIVERY TIME LESS THAN 24 HOURS..!! SUPER FAST SERVICE..!! 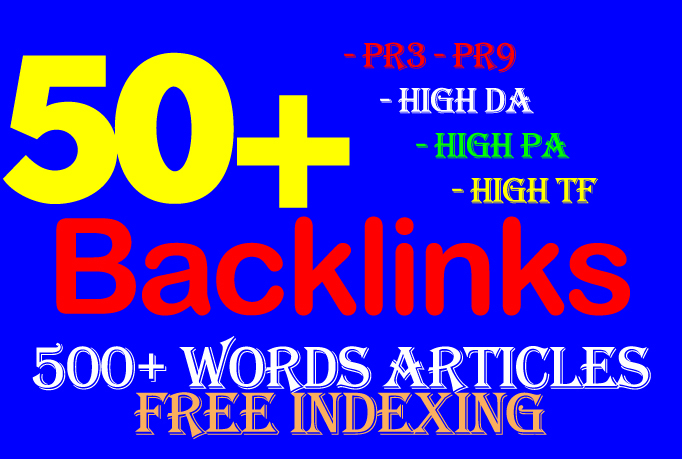 Indexing 50 PR9 backlinks with keyword related articles is ranked 5 out of 5. Based on 110 user reviews.